ASSISTANT RECORDER OF THE SOUTH REGISTRY DISTRICT OF MIDDLESEX COUNTY vs. MINNESOTA MINING AND MANUFACTURING CO., and INDIKON CO., INC. The Assistant Recorder of the South Registry District of Middlesex County filed a petition praying for instructions to correct Certificate of Title No. 153359 held by respondent Indikon Co. Inc. (hereinafter Indikon) by adding thereto a reference subjecting part of the land described in said certificate to a ten foot right of way held by respondent Minnesota Mining and Manufacturing Co. (hereinafter MMM.) Petitioner alleges that the easement was omitted through inadvertance and mistake. Respondent MMM, owner of the land benefitted by the omitted easement, answered consenting to the petitioner's prayer subject to a minor change in the description of the right of way. Respondent Indikon owner of the land burdened by the omitted easement, answered objecting to the petition and asks that the requested instructions not be given. 1. Original Certificate of Title No. 102937 (Exhibit A) [Note 1] was issued by the South Registry District of Middlesex County in the name of Jacet Realty Corporation. 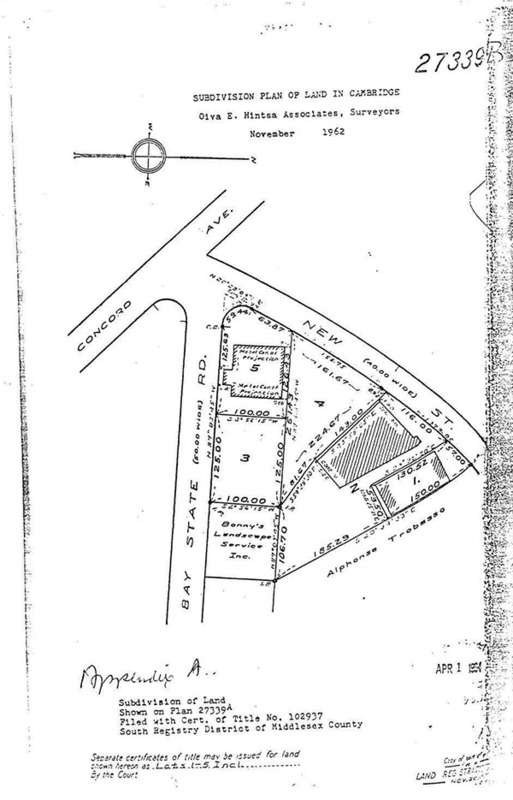 There is appurtenant to the above described land an easement and right to use as a right of way in common with Jacet Realty Corporation, for all purposes for which rights of way are customarily used in the City of Cambridge, the ten foot right of way over Lot 4 shown on said plan, (Appendix B) set forth in Deed Document No. 403732. Document No. 403732 was noted on the Memoranda of Encumbrances in the Jacet Realty Corporation Certificate of Title No. 102937. 5. Thereafter, on March 22, 1967 Lot 3 was deeded by Cardiosonics to respondent MMM by Document No. 442001 (Exhibit D). Certificate of Title No. 123358 (Exhibit E) dated March 31, 1967, thereupon issued to respondent MMM, and described the appurtenant right of way over Lot 4 as set forth in Document No. 403732. (See paragraph 3 above) Thus from March 22, 1967 on, MMM owned Lot 3 with an appurtenant right of way over Lot 4. 7. Certificate of Title No. 138428 (Exhibit G) was then issued to the Jacet Realty Trust. However, through inadvertance and mistake, the aforesaid easement was not set forth on said Certificate of Title No. 138428. On the Memoranda of Encumbrances of said certificate was a reference to Document Number 511941, (Exhibit I) a grant of easement to Cambridge Thermionic Corporation. 8. 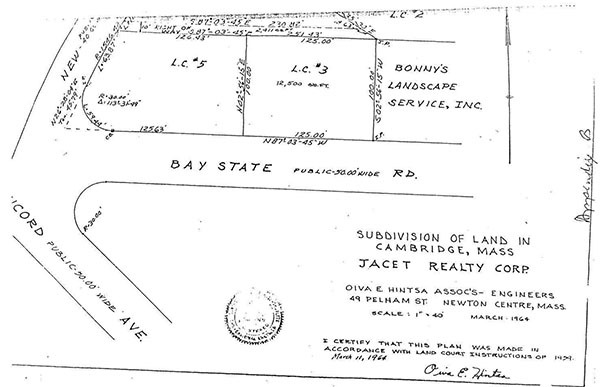 Document 511941 (Exhibit J) describes this easement as one for electric and telephone lines to be located "upon, along and across a private way ten feet in width being the southerly boundary of Lots 2 and 4 shown on a subdivision plan of land in Cambridge, numbered Land Court Plan No. 27339B. This easement is not shown on said plan. See Appendix A. 9. The Trustees of Jacet Realty Trust Company conveyed said Lots 1, 2 and 4 to Indikon Co., Inc., for value by deed dated October 24, 1977 and registered as Document No. 562922 (Exhibit H). Certificate of Title No. 153359 (Exhibit I) was then issued in the name of Indikon Co., Inc. The aforesaid easement of MMM was not set forth in either the deed, Document No. 562922 or the Certificate of Title No. 153359. The easement to Cambridge Thermionic Corporation, Document No. 511941 (Exhibit J), was set forth in said Document and on the encumbrance sheet of said Certificate. 10. No officer, director, stockholder, employee or agent of Indikon Co., Inc. had actual notice of said easement or any instrument creating or referring to said easement until after the purchase of said Lots 1, 2 and 4 on October 24, 1977. The sole question presented herein is whether or not certificate of title No. 153359 held by respondent Indikon should be corrected by having the easement of respondent MMM noted thereon. The Court answers in the affirmative. Certificate of Title No. 123358 (Exhibit E) was issued to MMM on March 31, 1967. (Paragraph 5) It contained the appurtenant right as set forth in paragraph 4 herein. §46. Encumbrances affecting certificates of title. MMM received a certificate of title as a subsequent purchaser. There has been no question raised but that this was for value and in good faith. MMM was entitled thus to hold the same free from all encumbrances except those noted on the certificate and those exceptions are not here material. MMM has been in no way remiss in any duties it might have. Indikon was issued certificate of title No. 153359 October 24, 1977, over ten years after MMM had received its certificate of title. No mention of an easement to MMM was set forth therein, although on the encumbrance sheet there was a reference to document number 511941, a different easement for telephone and electricity, from "Leo E. Wolf et al Trs. to Cambridge Thermionic Corporation". (See paragraph 8) In addition this latter easement was noted in the deed from the said Wolf, Trustee of Jacet Realty Trust (Exhibit H) to Indikon. Assuming without deciding that Indikon had no constructive notice of the MMM easement by document Number 511941, it, as MMM before it, should be able to rely on its certificate of title in accordance with Section 46. Obviously in this instance it could not. Its grantors', the Trustees of Jacet Realty Trust's, Certificate of Title made reference to document number 511941, the easement of Cambridge Thermionic Corporation for the transmission of electricity but not to the MMM easement. Neither easement was shown on Land Court Plan 27339B referred to in document number 511941. Appendix A. The petitioner admits that the MMM easement was omitted through inadvertance and mistake from Certificate of Title No. 138428 issued to Jacet Realty Corporation. (Paragraph 7) Thus when Indikon took title an examination of this certificate of title of the Jacet Realty Corporation would not reveal the easement to MMM. A person who, without negligence on his part, sustains loss or damage, or is deprived of land or of any estate or interest therein after the original registration of land, by the registration of another person as owner of such land or of any estate or interest therein, through fraud or in consequence of any error, omission, mistake or misdescripticn in any certificate of title or in any entry or memorandum in the registration book, may recover in contract in the superior court compensation for such loss or damage or for such land or estate or interest therein from the assurance fund; but a person so deprived of land or of any estate or interest therein, having a right of action or other remedy for the recovery of such land, estate or interest, shall exhaust such remedy before resorting to the action of contract herein provided. This section shall not deprive the plaintiff of any action of tort which he may have against any person for such loss or damage or deprivation of land or of any estate or interest therein. But if the plaintiff elects to pursue his remedy in tort, and also brings an action of contract under this chapter, the action of contract shall be continued to await the result of the action of tort. Assuming that there was no negligence on the part of Indikon, it would appear that this is a classic case for a claim under section 101. The case of Paquin vs. Anschutz decided by the Land Court on March 16, 1979 and in which a motion for a new trial is still pending was decided on the ground of estoppel. The Anschutzes were estopped from asserting their claim to easement even though their certificate was first in time as is the MMM one here. This was based on the theory that the Anschutzes had the last clear chance to discover that this easement was not noted on its common granters' encumbrance sheet and that some 26 years then elapsed before the Anschutzes attempted to rectify the matter. The situation of MMM is clearly different here as it had no occasion to look again at its back title. The Court rules that the petitioner shall add a reference subjecting Certificate of Title 153359 held by Indikon to the easement of MMM as set forth in Document No. 403732. [Note 1] All references to exhibits are to exhibits attached to the stipulation of facts filed by respondents. [Note 2] Appendix A is a copy of Land Court Plan No. 27339-B. [Note 3] Appendix B is a copy of the "Subdivision Plan" as set forth above. [Note 4] For convenience the title is listed as being held by Jacet Realty Trust rather than in individual names as Trustees of the said Trust.